My first ever DOTW post back in 2011 covered the Martini. 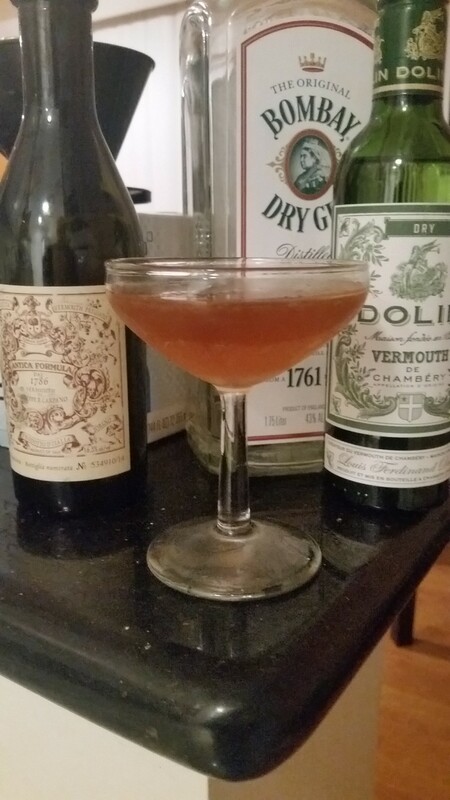 It’s nevertheless taken me until just the last few weeks to start exploring the ancestry of that most iconic of cocktails, which a lot of people assume kind of begin and ends with last week’s Martinez. Still, it’s name aside, that very good but very sweet drink has more differences than similarities with the modern oh-so-dry Martini beverage. Today, I’ve found a drink that, while still pretty sweet, really does seem to be the semi-missing link between the Martinez and the Martini. The Gin and It — “It” being short for “Italian,” as in Italian vermouth, as in sweet vermouth — is pretty much what the name implies. 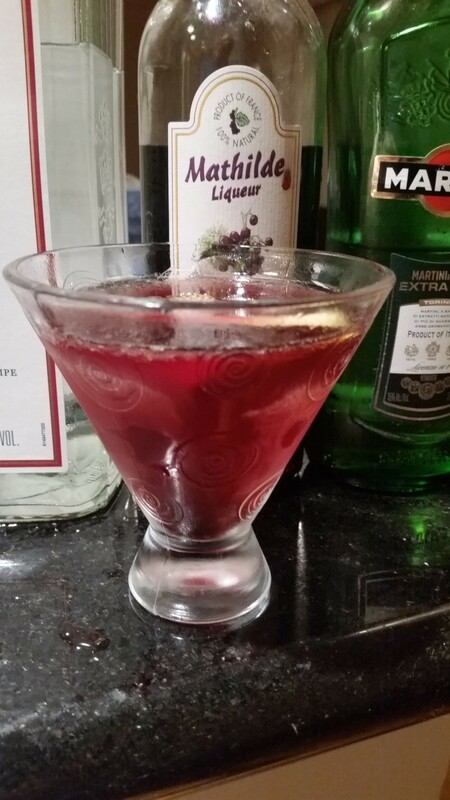 While some versions weirdly call for using no ice whatsoever, my version of the drink, at least, is very close to my comparatively high-vermouth starter version of a Martini, save for the species of vermouth. 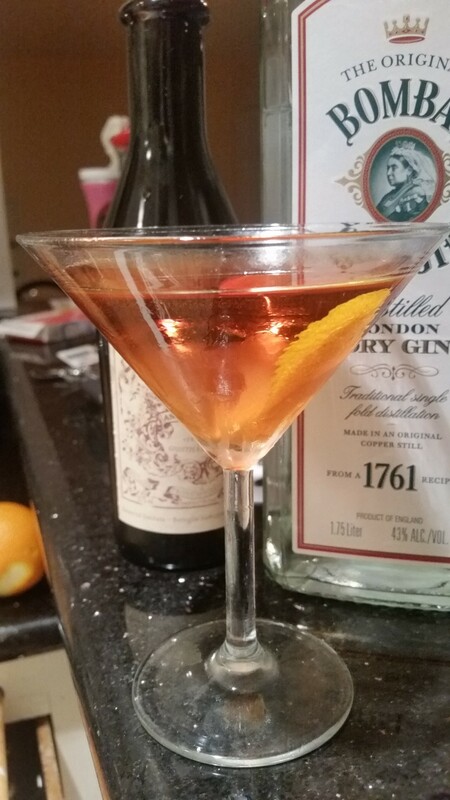 It’s also just about identical to my take on a Manhattan (the second DOTW), except for using gin and not whiskey. Now, here’s the kicker. Back in 1930, Harry Craddock’s epochal The Savoy Cocktail Book, actually listed three types of Martini, one of which was called the Sweet Martini, which, like my Gin and It, calls for 2 parts gin and one part Italian vermouth. His dry version of a Martini called of one part dry vermouth and 2 parts gin. Today, of course, a dry martini typically means one with either only a hint of vermouth or even (and I don’t like this) none at all. Considering Mr. Craddock, however, it seems pretty darn likely that when the first person uttered the quip, “let’s get you out of those wet clothes and into a dry Martini” they meant a drink made with dry vermouth (perhaps Martini brand), not little or no vermouth. Anyhow, here’s the perfect drink for anyone craving a very un-dry martini as in one that’s actually sweet….but still pretty close to an actual Martini. Combine your liquid ingredients in a mixing glass or cocktail shaker. As if to foreshadow Ian Fleming, Harry Craddock actually instructed that ALL of his martinis should be shaken, but I prefer my martinis stirred, not shaken. (Gin seems to me to take on a slightly less pleasant flavor when shaken, don’t ask me why.) Definitely use ice. Strain into chilled cocktail glass and add the garnish of your choice, if any. Toast vermouth, both sweet and dry. It is one of the most honorable, yet misunderstood and unfairly maligned of cocktail ingredients. While notably less complex than the Martinez, the Gin and It is also a bit drier, at least at my proportions. (Many versions call for equal parts gin and sweet vermouth.) It pretty much tastes like a Manhattan made with gin, and that’s not a bad thing . I tried this with Bombay Gin, Gordon’s Gin, Carpano Antica and, yes, Martini. While I can’t say any version of the drink rocked my world — I actually enjoyed the Martinez a great deal more — the best version was made was the higher end ingredients; I suppose that’s not a surprise. I also haven’t a clue why this drink isn’t as least as well known as, say, a Gimlet. I will speculate, however, that the idea being promulgated in some quarters of the Internet that the platonic form of the Gin and It is made without ice might have something do with the idea. Suffice it to say, the room temperature Gin and It is not for everyone, and, this case, the everyone it’s not for includes me. It’s not that it tastes bad, it’s just that there’s a reason we dilute and chill this stuff with ice. “Fin de siècle” is French for “end of the century, which means that we’ve all missed our opportunity by 15 years to have a Fin de Siècle at the most appropriate point possible, assuming we were old enough to drink in 2000. Or, if you want to look at it the other way, we’ve all got 85 years to work on preparing the perfect Fin de Siècle in time for 2100. The truth is, however, that the real roots of this post go back not to Y2K but to last week. My copy of Ted Haigh’s Vintage Spirits and Forgotten Cocktails having been destroyed by a backed-up sink…yes, I leave cocktail books on the sink sometimes and, yes, I’m paying the price…I found myself seeing a number of somewhat similar cocktails in Robert Hess’s accurately named The Essential Cocktail Guide. 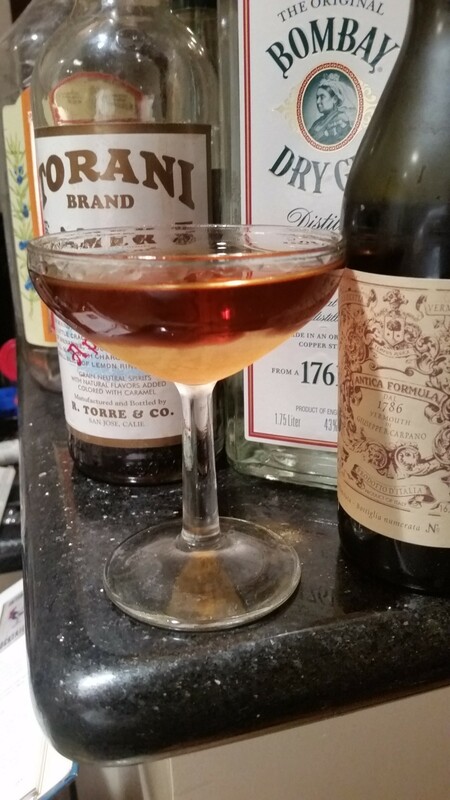 Like last week’s drink, today’s drink contains sweet vermouth, orange bitters, and Torani Amer, substituting for Amer Picon — easily the most commonly called-for modern day cocktail ingredient that you can’t find anywhere in North America. The main difference, aside from the proportions, is that our base spirit is changed out from whiskey to gin. The result is a bit lighter and drier, but no less tasty and sophisticated. Combined all ingredients in a cocktail shaker or mixing glass with plenty of ice. Stir vigorously — or shake, gently, if you’re feeling rebellious — and strain into a chilled cocktail glass. Toast anything that has come to conclusion or shortly will, including your tasty Fin de Siècle. Nothing lasts forever, after all, least of all a good cocktail. I saw a few recipes online for this that mentioned Plymouth Gin, but most people seem to use your more garden variety London Dry style gin. I used premium (but I guess not super premium) Bombay Dry Gin and good ol’ value-priced Gordon’s Gin, both with results that were more than satisfactory. I actually found that,much more than with the gin, my choice of sweet vermouth made a far more dramatic difference in the flavor. 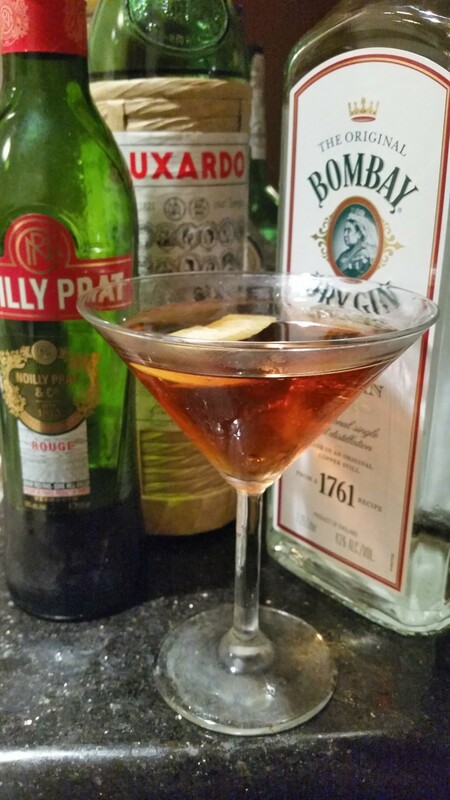 I was very happy with my Fin de Siècle when I used Noilly Pratt — my personal default sweet vermouth in slight preference to Martini or Cinzano. Still, there was no topping the slightly bitter, almost chocolate-like undercurrents of Carpano Antica; sometimes you just can’t argue with the cocktail snobs. If you want a sweeter drink that’s nevertheless not too offensive, I had decent luck replacing Torani Amer with Amaro CioCiara, suggested by some as another Amer Picon substitute. Finally, yes, you can shake this drink but that’s not my preference this time around. For starters, this is second cousin to a gin martini. (We’ll be getting to it’s first cousin very soon). I really do think there may be something to the idea that shaking can “bruise” gin, i.e., add a slightly unpleasant bitterness. Mainly, though, I don’t think the additional water/ice crystals that shaking generates really flatters the Fin de Siècle. I think this may be a drink that wants to be cool, but not ice cold. Now, have a great Memorial Day weekend. Maybe it’s a good time to remember what life could be, if only we were all nice enough and smart enough.